"Independent developer Dennaton Games and rogue game publisher Devolver Digital have announced that the award-winning Hotline Miami will arrive on the PlayStation®3 (PS3™) and PlayStation®Vita (PS Vita) this coming spring. Crashing onto the scene last fall, Hotline Miami grabbed the attention of gamers all over the world with stylish sights and sounds, tough as nails gameplay, and a perplexing narrative that garnered Dennaton Games’ debut effort awards and nominations from nearly every video game media outlet. Hotline Miami has gone on to sell over 300,000 units on PC and solidified its place amongst the best releases of 2012." "Dutch developer Abstraction Games has been appointed to deliver Hotline Miami’s trademark style and gameplay to both PS3 and PS Vita via PlayStation®Network under the guidance of Dennaton Games. 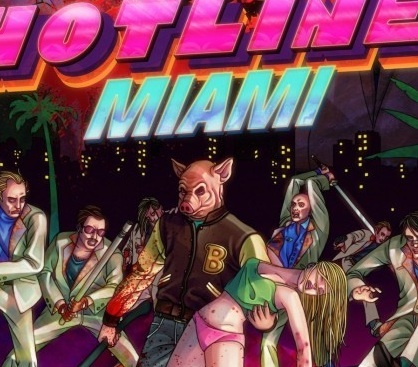 Hotline Miami will also launch with Cross-Buy allowing gamers to play Hotline MIami on both PS3 and PS Vita with a single purchase. Boom." Tell us what you think about Hotline Miami coming to the PS Vita in the comments section below!